Choctaw Nation Health Care Center in Talihina. Moving to a rural Oklahoma town can be hard selling point for the state’s tribes, especially for high-demand, skilled professions like doctors and chefs. The Journal Record newspaper released a special issue this week, Building Bridges, that looks at the tribal impact on Oklahoma’s economy. 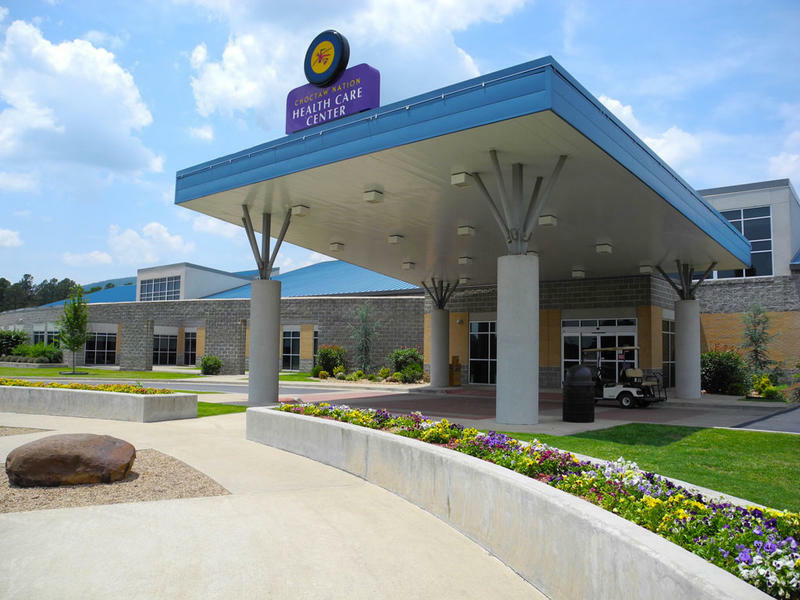 As part of the issue, reporter Catherine Sweeny noted that tribal healthcare facilities have to compete with metropolitan areas to attract doctors. Tribal health facilities face many of the same problems all other rural providers do: smaller schools, fewer employment and education opportunities for family members and medical students’ desire to stay near their schools. Tribal leaders say misperceptions plague the centers. City dwellers often don’t see small towns’ benefits. Most other perceptions involve doctor pay, anything from a lower expected salary to a less insured patient pool. Journal Record editor Ted Streuli told KGOU that tribes are competing with much larger markets for doctors’ services, but many tribes are providing nationally competitive pay and other incentives to prospective doctors. “They offer to repay student loans, undergraduate and medical school loans, they offer scholarships and they offer retention incentives in a lot of cases, so there are a variety of packages to try to attract and keep those doctors,” Streuli said. Tribe-owned casinos meet many of the same barriers when they try to recruit professional chefs. The Journal Record’s Molly Fleming reports that many casinos have top-notch kitchens, but it is difficult to attract trained, professional chefs to cook. Streuli says tribal casinos are using work-life balance as a selling point for potential employees. “The Choctaws spoke about that with a lot of emphasis, that for most corporations it’s all about the bottom line, but with the tribe they truly believe and promote a great life and work balance, which can be hard for chefs and sous chefs to find elsewhere,” Streuli said. The Quapaw Tribe of Oklahoma raises their own beef and bison, which is then used in the casino’s restaurant. Streuli says that can help lure chefs. “Chefs really love to be close to where the food originated. So there are some things like that that can be very attractive,” Streuli said. Jacob McCleland: Ted, let’s start with a story by Journal Record reporter Catherine Sweeney that looks at competition between tribal healthcare providers, and nearby hospitals. The problem for a lot of tribally-run health providers is recruiting doctors and nurses to live and work in rural towns. What are the tribes doing to attract them? Ted Streuli: One of the big things they have to fight is this perception that small towns don’t have much to offer. They really feel like if they can show them what a really great lifestyle there can be in a lot of these places, it becomes a much more attractive option. We talked to one doctor who spent most of his career in Tulsa and decided to move to Talihina to work for a tribal health clinic, and he said he’s been just delighted to live in Talihina. There’s a lot more to do than he expected, and he’s really enjoying the lifestyle. That’s what they want to communicate. McCleland: Even though the tribes’ hospitals and clinics are in rural areas, many are relatively close to metropolitan areas like Tulsa and Fort Smith, Arkansas. What are the tribes doing to retain healthcare professionals? Streuli: Well, they really do compete against hospitals in those larger metropolitan areas so they offer nationally competitive pay because they can subsidize their own hospitals. They offer to repay student loans, undergraduate and medical school loans, they offer scholarships and they offer retention incentives in a lot of cases, so there are a variety of packages to try to attract and keep those doctors. McCleland: What are the perks for doctors who work at tribal health facilities? Streuli: One of the really interesting ones we learned about is that tribes have special access to doctors across the country. Once they are working in an American Indian health facility, the doctor can transfer to any other state within that system, regardless of where the medical license originated. So there are some things like that that are available to doctors at other hospitals. McCleland: I want to stay on this topic of recruiting professionals to work in rural Oklahoma. Many of tribe-owned casinos in Oklahoma are located, obviously, in rural areas. Journal Record reporter Molly Fleming writes that the casinos have top-notch kitchens, but it’s hard to find chefs to man them. What are rural casinos doing to bring in professional, top-notch chefs? Streuli: Well, they are doing a lot of things, and of course they face many of those same problems we just talked about with the hospitals. But they offer a potential chef or sous chef a pretty good corporate environment that they might not find in the traditional sectors. And they really pitch their family-friendly culture. The Choctaws spoke about that with a lot of emphasis, that for most corporations it’s all about the bottom line, but with the tribe they truly believe and promote a great life and work balance, which can be hard for chefs and sous chefs to find elsewhere. McCleland: For a chef, what are the advantages of working in a rural place like this? Streuli: A lot of the same ones those doctors enjoy, but there are some peculiar things that are unique to the kitchens. They Quapaw Tribe in Oklahoma can offer its recruits to the kitchen staff an advantage of the rural area in that they raise their own cattle and their own bison, and then they use that meat in their steakhouse. And chefs really love to be close to where the food originated. So there are some things like that that can be very attractive. McCleland: How are the tribes working with schools and universities to cultivate culinary talent? Streuli: Well, with the high schools, they are putting out resumes of chefs to give them some ideas of what their career path might be. They also work with schools like Tulsa Tech, with culinary programs. They have a big program with OSU, who’s involved in their internship programs, and they host interns from all over the country. McCleland: Ted Streuli is the editor of the Journal Record newspaper, and he joins us weekly to talk about business news around the state. Ted, as always, thank you so much.